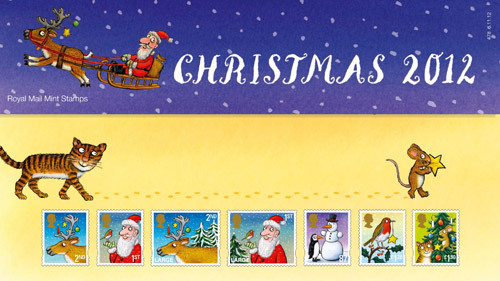 Each Christmas Royal Mail processes 2 billion items of post; many sent this year will feature the new Christmas stamps issued today. 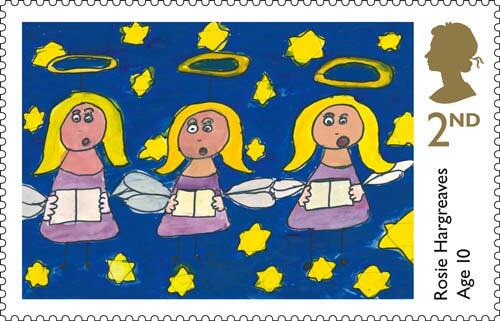 Royal Mail’s policy for Christmas stamps is to alternate non-secular and secular themes. 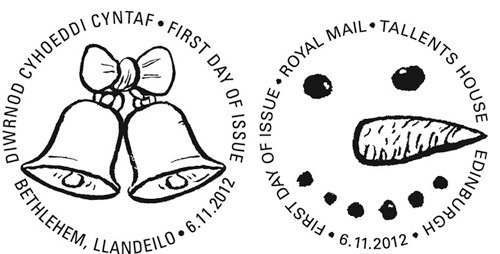 The 2010 stamps featured children’s characters Wallace and Gromit, and this year the Nativity is the theme. The seven new stamps are inspired by verses from the Gospels of Mathew and Luke, and recognise that 2011 is the 400th anniversary of the King James Bible. 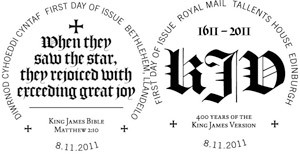 Two first day of issue postmarks, also inspired by the King James Bible, are available. Stamps and stamp products are available at all Post Office branches, online at www.royalmail.com/stamps and the Royal Mail eBay shop, and from Royal Mail Tallents House (tel. 08457 641 641), 21 South Gyle Crescent, Edinburgh, EH12 9PB. One of five stamps issued by Royal Mail in 1989 to commemorate both Christmas and the 800th Anniversary of Ely Cathedral. This stamp is a “semi-postal”, meaning that a charity surcharge (of 1p) was added to the price of the stamp. 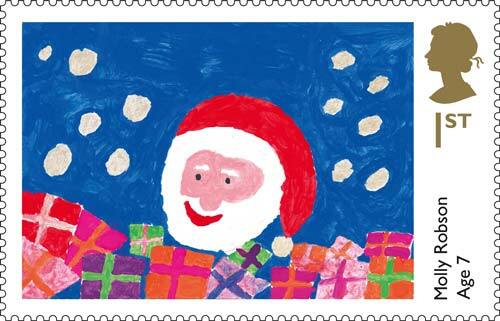 One of several designs submitted to the GPO by Arnold Machin for Britain’s 1968 Christmas stamps. Machin is best known as the designer of the Queen’s Head definitive stamps (known as Machins) still in use today. Royal Mail has today released this year’s Christmas stamps, a set of seven adhesive stamps designed by Andrew Ross, featuring stained-glass windows produced in the 19th Century. 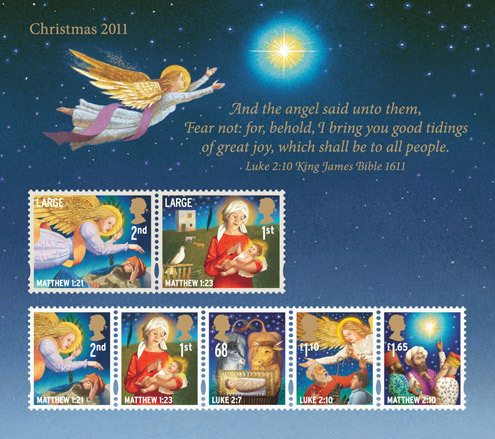 It has generally been the tradition for British Christmas stamps to alternate between religious and more secular themes, and these stamps come on the back of last year’s Christmas pantomime stamps. Perhaps surprisingly, stained-glass windows have only appeared on Christmas stamps twice before, in 1971 and 1992. The 1971 stamps were designed by Collis Clements who had submitted his original designs to the Stamp Advisory Committee for the 1970 Christmas stamps. While designs by Sally Stiff were chosen in 1970, Clement’s were held over for 1971 and were judged to be better than those submitted by other designers in that year. As Clement’s stamps depicted scenes from a 12th century stained glass window in Canterbury Cathedral the Post Office decided to provide a special pictorial postmark at Canterbury. It was circular, 15/16 inches in diameter, with the Cathedral as a central motif. First day of issue (FDI) postmarks for ‘Bethlehem, Llandeilo, Carms’ had become popular with collectors since the first British Christmas stamps were issued in 1966 and for the Christmas 1970 stamps the Post Office provided a pictorial FDI postmark at this location. The pictorial postmark had been considered a success by the Post Office and was repeated in 1971 with a different design, this time showing a star-shaped snowflake motif to the left of a circular datestamp, 2¾ inches by 15/16 inches. The tradition of a FDI postmark for Bethlehem continues to this day, with a stained-glass window-style “praying hands” design available this year. The 1992 stained glass Christmas stamps were designed by Carroll, Dempsey and Thirkell who have worked on a number of projects for Royal Mail including the Millennium series (1999-2000), Machin stamp books, the Microcosmos Prestige Stamp Book (2003) and Sounds of Britain (2006). Like this year’s Christmas stamps, the 1992 issue featured stained-glass windows from a variety of churches around Britain.